Today, GLSEN and PFLAG join together to re-launch our #ClaimYourRights Campaign, to help anyone affected by or witnessing anti-transgender discrimination in our schools file a complaint with the Office for Civil Rights at the Department of Education. Secretary DeVos clearly needs to better understand the extent of the daily pain and real barriers to wellbeing that the original Departmental guidance was designed to address and eliminate. We must see if her actions will live up to her words, and to the promises made by federal law and the United States Constitution. Get answers to your frequently asked questions on the rescission of Title IX guidance to transgender students. Provide important education to people in your community. Take the Claim Your Rights flyer with you to meetings and rallies. Promote local events on your PFLAG social media. Print a poster for your rallies. Thank you for everything you do to create a community where diversity is celebrated and all people are respected, valued, and affirmed inclusive of their sexual orientation, gender identity, and gender expression. We need to share some disturbing news: There is a real possibility that the life-saving Title IX nondiscrimination guidance to protect transgender students might be rescinded. We have neither commented on nor responded to rumors in the past month, but this time it’s different. This is more than needless chaos; even just considering this action is harmful to vulnerable kids. We do not and will not accept these games as a new normal, not when the emotional and physical safety and lives of transgender kids are at stake. The latest National School Climate Survey punctuates the real preventable dangers that so many vulnerable transgender youth face at school every day; the Title IX guidance is life-saving to them. The nondiscrimination protections afforded under Title IX remain in place, so rescinding the guidance will only confuse local school districts, cast a shadow over how the law should be implemented, and send the wrong signal about your federal government’s investment in protecting not only transgender kids, but all LGBTQ youth in school. This is wrong; this is dangerous; this is unacceptable. Brace yourself if you are a parent of an LGBTQ child in a school environment. Remember, PFLAG is here to support you, to provide community education, and to advocate for your family. Check on vulnerable youth who will hear these rumors and be scared for what it means for them. Send the absolute message that you are in their corner, that the law is still on their side, and you and PFLAG will fight for their dignity, safety and rights. Connect with school administrators and remind them that Title IX is still federal law, and they have the power to not abandon the evidence-based guidance designed for the best school environment outcomes for youth. Regardless of your connection to a school-age child, remember the power of your zip code, and connect with your two U.S Senators and one Representative. 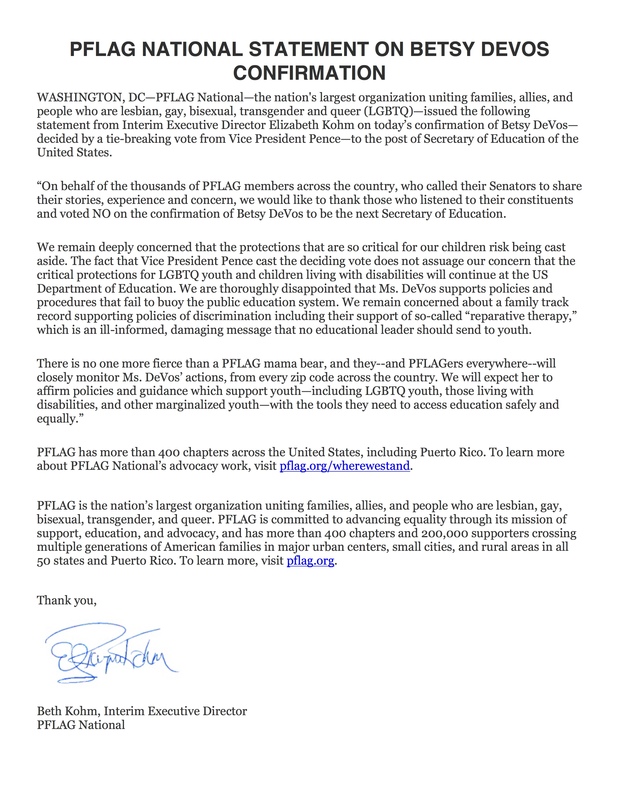 Tell them clearly this endangerment is not acceptable, and you expect them to prioritize the urgency of protecting the safety of vulnerable LGBTQ children. If you can, do so in person this week while they are back home near you. Call your local media to share your story and attend your next school board meeting. We need to bring visibility to this reckless endangering move, and send an unequivocal message that we will not stand to see the lives of transgender children–or any LGBTQ children–put at risk.